I have worked to pass HB 18-1276: Teaching Competent History in Schools, a bill aimed at widening the historical lens given to our students, by including the perspectives of American Indians, Asian-Americans, African-Americans and Hispanic Americans. 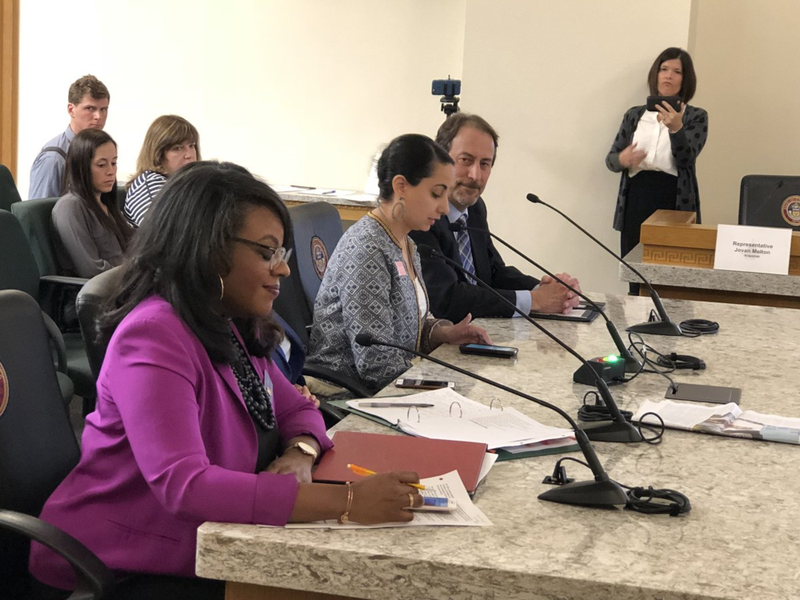 This bill would have given Colorado students a distinct advantage in global business, science and policy by familiarizing them with the customs and contributions of the world around them. I have also supported SB 18-087, which provided in-state tuition for refugees, combat interpreters and other foreign nationals who supported our troops in combat. This landmark legislation is now model policy for other states as we head into 2019. I am pleased to say that this bill was signed by Governor Hickenlooper in 2018. Photo at the Community College of Aurora with Governor Hickenlooper at the In-State tuition for Refugees, Combat Interpreters and Other Foreign Nationals Bill signing. Photo of Iman Jodeh speaking at the Federal Government Overreach Rally on the West Steps of the Capitol. Through my work at the Interfaith Alliance, I continued to advocate for policy like HB18-1067, the Right to Rest Act. The notion that being homeless is a choice was one we fought hard against by supporting the Right to Rest Act. I was also honored to present to award to Denver Homeless Out Loud, a Denver based organization that works with individuals who have or who are experiencing homelessness, during the 2017 Force for Good Awards for the work in advocating for the homeless community in Denver. It is very humbling to watch the amazing work they accomplish as some of their members are currently experiencing homelessness and advocate for dignity. It was an honor to be a part of historic legislation that removed slavery from the Colorado constitution. I was able to leverage my connections in the Muslim community to support Amendment A and continue to show faith-based participation at the Capitol. Many Coloradans were unaware that such harsh language still existed in our State constitution, so it was imperative that I communicate the need to vote Yes on A. For two years, I fought to pass HB17-1230/HB18-1273, Protect Colorado Residents from Federal Government Overreach that protected Coloradans based on their status or sexual orientation. This bill was in response to the harsh rhetoric out of the Trump campaign and later White House referencing Muslim internment camps and a Muslim registry. This bill also protects the rights of any other marginalized groups based on the status and was expanded to include the LGBTQ+ community. I was the liaison between lawmakers and multiple communities involved, helping legislators understand the enormous stakes of this policy. The Colorado Civil Rights Division (CCRD) was the first of its kind in the country - and I worked hard to support its mission and protect all Coloradans. As a small business owner, minority and woman of color, I have a deep understanding of the important role the CCRD plays in my daily life, including protecting my rights as an employer and the duties I have to my employees. And just as those same employees are protected by the civil rights they enjoy at my small business, the CCRD affords me the same rights as an employee when employed. Iman Jodeh testifying for the Right to Rest Bill sitting next to Rep. Leslie Herod.